The Kelowna Rockets should feel good about the weekend. No, not because of their sluggish play. The Victoria Royals were the better team in both games. The Rockets should be grateful to come out of the two games with no less than two points. In essence, the WHL leaders closed out the weekend in the same position they entered it. The Rockets have a slim three point lead on the Royals for top spot in the Western Conference, but the lead has diminished to just a single point on Red Deer for top spot in the Western Hockey League. 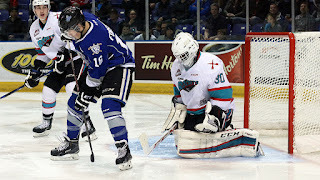 While the team wasn't very good Friday in a 3-1 win, thanks primarily to goaltender Jackson Whistle, Saturday's 5-1 loss was a greater indication of how poorly the Rockets played and how determined the Royals were in handing their BC Division rivals their 6th regulation loss of the season. A lack of discipline has been a factor for the Rockets this season and it rears its ugly head Saturday night in the 5-1 loss. The Rockets took eight trips to the penalty box and the Royals promptly scored four goals with the power play. The eight penalties could be expected if the Royals played the in-your-face style we have been accustomed to over the years, but Dave Lowry's crew no longer plays that way. They play smart, tactical hockey where they attempt to outwork you. If you are lazy and use your stick to check, you will find yourself in the penalty box. That was the case Saturday and was the case Friday when the Rockets were fortunate to kill off all six power play chances the Royals were granted. On Saturday night the Royals power play unit was crisp and the visitors paid mightily. Speaking of the Royals, is it not amazing how head coach Dave Lowry has changed the way his team plays? It is a stark contrast to a season ago. The Royals were arguably one of the dirtiest teams in the league last season. They would try to beat you into the ground physically and when the game was over the scars on your body was a sure sign you were in a battle. But with a smaller team this season, Lowry has altered the way they play likely more than any other team I've seen this season. From year-to-year, most teams in the WHL play generally the same way. Not the Royals. Outside of outworking the opposition, which is a Dave Lowry staple, the Royals are much different in their tactical approach to beating the opposition. Frankly it's impressive. The Rockets generated a season low 15 shots on net in Saturday's loss. No wonder they trailed 3-0 after 40 minutes when they fired only 9 shots on the Royals net. Cole Linaker scored the lone goal for the Rockets, his first in eight games. I thought it was a pretty good weekend for 16 year-old Jonathan Smart. I think the rookie is outplaying fellow fresh faces Brayden Chizen and Danny Gatenby for ice time. November will go down as a solid month for the Rockets. They suffered one regulation loss in 11 games (9-1-1-0). By comparison, last season in 14 November games the team was (9-2-3-0). We are only 25 games into the 2015-2016 Western Hockey League season and one thing is abundantly clear. Jackson Whistle is the Kelowna Rockets most valuable player. 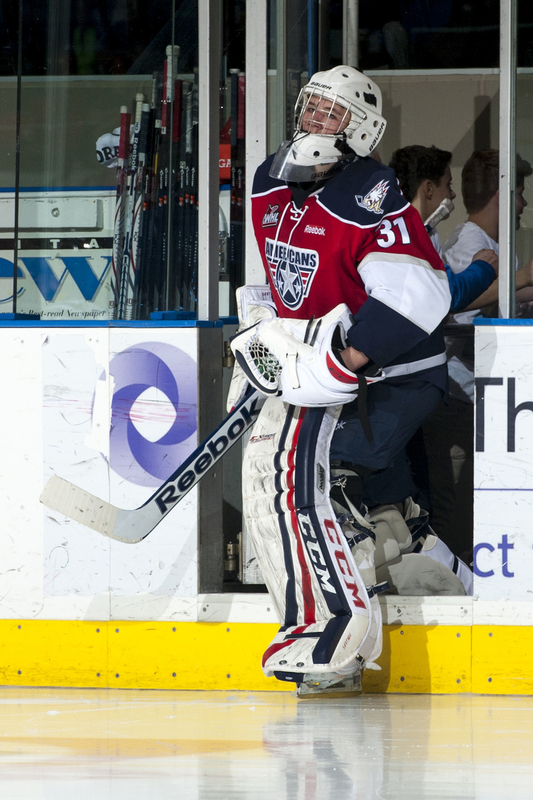 The 20 year-old proved it again Friday night with a 34 save performance in a 3-1 win over the Victoria Royals. Whistle made several solid stops in the teams 19th win of the season, including one that saw a shot go off the top of his mask with the Royals attempting to tie the game at two. Whistle looked as calm as ever as his team struggled to clear the puck in front of him. Often under siege, specifically in the final 40 minutes, Whistle looked unbeatable until Royals leading scorer Alex Forsberg fired a one timer past him with close to seven minutes gone in the third period. The win was Whistle's league leading 14th of the season and it was his 9th consecutive start that allowed his team to earn, in a worse case scenario, a point in the standings. The two points in Victoria Friday night move the Rockets five points up on the Royals for first place in the Western Conference while also staying three points up on Red Deer for first place in the overall standings. Tyson Baillie had a goal and an assist which gives him 44 points on the season. That allowed the 20 year-old to move into the WHL scoring lead with one point more than Moose Jaw's Brayden Point. Baillie is now three assists shy of 150 for his career. While the Rockets scored twice on the power play, they were also able to go 6 for 6 on the penalty kill. The best chance the Royals had to score in the second period was when Tyler Soy hit the goal post shorthanded while cutting inside on Rockets d-man Cal Foote. Soy somehow lifted the puck past the outstretched glove of Whistle, but it hit the goal post and stayed out. The Rockets haven't lost in regulation time on the road in seven consecutive games. The last outright loss on opposition ice came October 16th in a 3-0 setback in Prince George. It was the 4th time this season the team has surrendered only one goal against. A stick tap to the Victoria Royals for keeping a count on the number of shots taken by a player during the course of the game. You can see the column on the WHL website game sheet, yet often times it is never filled out by the home team. In this case, it showed Justin Kirkland had five shots on net while Calvin Thurkauf had four. The Rockets d-core had a combined three shots on net with Cal Foote having two of them and Devante Stephens having one on a second period shot from the left point. The two teams meet again Saturday night at Save on Foods Memorial Centre. The Rockets will have to be much improved in all facets of the game outside of goaltending. Frankly, on Friday night at least, that can't get much better. Tonight’s Preview: The Kelowna Rockets wrap up a three game home stand tonight against the visiting Seattle Thunderbirds. This is the first of only four meetings between these two teams this season. The T-Birds make a return visit on February 8th. The Rockets make two appearances in Kent on January 28th and February 9th. 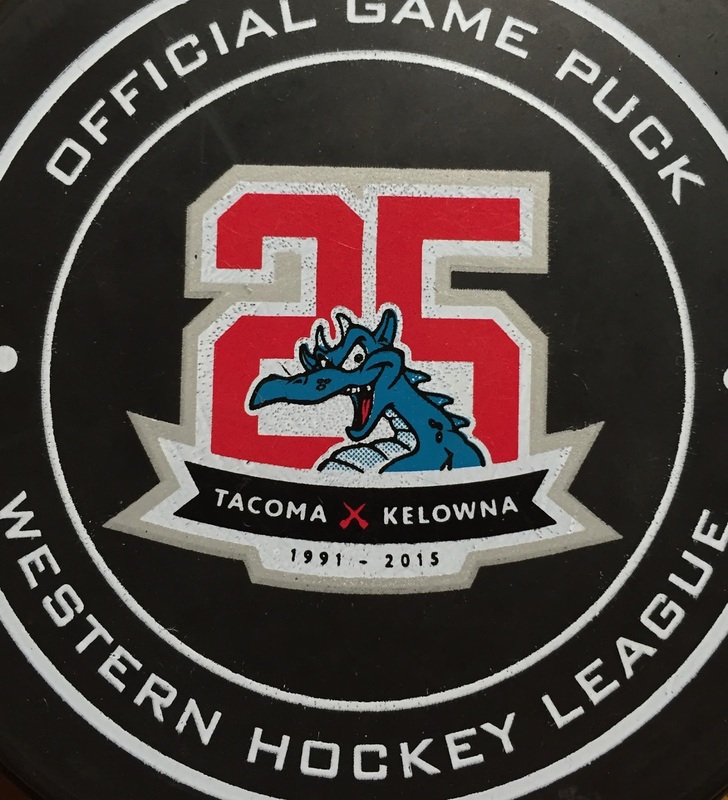 Last season the T-Birds beat the Rockets twice at Prospera Place by scores of 5-2 and 3-2 in overtime. The Rockets were a 6-2 winner in Seattle before falling 2-1 also at ShoWare Center. The Rockets have won 12 of their last 15 games overall (12-2-0-1) and are 8-2-0-0 on home ice and 9-3-1-0 on the road. Following tonight’s game, the Rockets travel to the Island to play the Victoria Royals this weekend. Overall, the Rockets have points in 9 straight games (8-0-1-0). Baillie POW Honours: Tyson Baillie is the WHL Player of the Week. Baillie had 3+4=7 in three wins last week and was a +5. Baillie is second in WHL scoring and leads the team in goals, assists, points, power play goals and is tied for the team lead in game winning goals with three. Baillie is only four points shy of the Rockets lead in penalty minutes. November Notables: Tyson Baillie has 6+8=14 in the month of November. Nick Merkley has 6+7=13 in the month while Justin Kirkland has 3+7=10. Kole Lind has 3+4=7. Cole Linaker has 2+4=6 in November. Tyson Baillie hits record books: Tyson Baillie had two assists last Wednesday in a 4-3 overtime win in Kamloops. Baillie now has 256 career points, becoming only the 5th player in Rockets franchise history to reach the 250 point plateau. Brett McLean had 375 points before being traded to Brandon in his 20 year-old season. John Varga had 333 career points with Tacoma. Jason Deleurme had 313 career points while Kiel McLeod had 261 career points. This and That: Three members of the Rockets have been rated by NHL Central Scouting. Lucas Johansen and Dillon Dube are rated as ‘B’ prospects for June’s draft in Buffalo. Tomas Soustal, who was not selected last year, is ranked as a ‘C’ prospect…Baillie has points in 12 of his last 13 games…Baillie has been held off the score sheet in just five of 23 games…Rookie Gordie Ballhorn leads the Rockets with a +14 rating…Rodney Southam is two goals shy from his career high 7 goals he scored last season….The Rockets have been to overtime in three of the last six games. The Rockets have won once in overtime and lost once in the extra period. One overtime game decided nothing and was reduced to the game ending in a shootout victory…. Cal Foote is the next player to blow out candles. Foote turns 17 on December 13th. December birthdays are rare on the Rockets roster. The last December birthday was Cody Chikie and Filip Vasko when the two suited up for the team during the 2011-2012 campaign….The Rockets are rated as the 6th best team in the country according to the CHL Top 10 rankings this week. The Rockets were rated 5th at the start of the season….Six of Justin Kirkland’s eight goals have been scored on the road this season….Jackson Whistle has started 14 of the last 18 games…Tyson Baillie has averaged 28 goals over his last three seasons…The Rockets next play three games in three nights January 29th, 30th and 31st with two of those three games on home ice….The Rockets had two players taken in the NHL draft. Nick Merkley was taken in the first round by Arizona. Devante Stephens was chosen in the 5th round by Buffalo…Cole Linaker (Oilers), Tomas Soustal (Flames) and Tyson Baillie (Flames) all received free agent tryouts. Who’s Hot: Kole Lind had a three game point streak snapped Saturday. Lind had 1+2=3 over that period…Rodney Southam has four goals in his last 7 games and 4+3=7 in his last 7…Tanner Wishnowski has two goals in his last 5 games….Nick Merkley has 6+6=12 in 8 games in the month of November….Kole Lind has 2+4=6 in his last 6 games…Tyson Baillie has 10+20=30 in his last 15 games …Dillon Dube has 8+10=18 in his last 9 games and has collected 15 points in his last eight games….Lucas Johansen has four more point this season as he did all of last year. With injuries to Rourke Chartier and Dillon Dube, 19 year-old forward Justin Kirkland is being forced to play centre. It looks good on him. Kirkland finds himself in the middle between wingers Tomas Soustal and Tyson Baillie and the unit is a scary threat to score. Kirkland has collected six assists in three games since making the move to the middle in a 4-3 overtime win Wednesday in Kamloops. The move, for whatever reason, is allowing Kirkland more puck possession and more quality shots on goal. With arguably the quickest release on the team, Kirkland's shot is handcuffing goaltenders and creating massive rebounds for his line-mates who are cashing in. A good example was Tyson Baillie's third period goal last night in a 5-2 home ice win over the Vancouver Giants. Kirkland's hard wrister wasn't controlled by Giants goalie Ryan Kubic. Like flies on a piece of raw meat, Soustal, Baillie and Kirkland converge on the rebound before Baillie rips it in. All three pick up points on the goal that made the score 4-0. A solid start for the Rockets after blowing out the Edmonton Oil Kings the night before. I was wondering if the team would come out lethargic, but surprisingly that wasn't the case. The Rockets looked to bury the Giants with first period goals from Calvin Thurkauf, who could have had three on the night, Baillie and Nick Merkley. For a team with only five wins this season, it was awfully tough for the Giants to dig themselves out of that hole. Give the visitors credit though. They appeared to get better as the home teams game became increasing fractured. The G-Men played with more desperation in an effort to bounce back and make it a two goal game before Merkley scored an empty netter for the Rockets 17th win of the season. The win moved the Rockets into sole possession of first place in the Western Conference with 35 points, one better than the Victoria Royals who lost in overtime against Tri City. I loved the pack mentality the Rockets showed when Giants forward Tyler Benson shot the puck at the Rockets net after the whistle was blown on a second period offside. All five players skated over to Benson and let him know they didn't like the late shot on Whistle. Strength in numbers is sometime far better than one individual wanting to defended the honour of the team. The pack mentality in that situation is such an encouraging sign for this team. Hats off to Giants forward Tyler Benson for fighting Rockets rookie defenceman Gordie Ballhorn. Ballhorn took exception to what appeared to be a light slash behind the net and challenged the 17 year-old to a fight. Benson, who is the Giants team captain, dropped the gloves and despite it being his first career WHL tilt, the highly touted forward came out of the scrap unscathed. Trevor Cox is known as one of the most dynamic 20 year-old's in the Western Hockey League. Shouldn't Tyson Baillie be granted the same status? Both players have almost the exactly same number of points. Baillie had 2+1=3 last night and now has 256 career points, one shy of Cox's 257. Baillie will go down as one highest scoring wingers ever in franchise history. Enjoy him while he is here! I want to give the Giants player's credit, specifically those on the bench, when Rockets forward Kole Lind was hit hard into the side boards in the first period after taking a shot on net. Lind was off balance when he was smoked into the side boards and stayed down for some time. When Lind got to his skates, several Giants players tapped their sticks on the boards or on the ice in a show of class and concern for Lind. A stick tap to the Giants organization as it looked good on their players. Have you noticed Joe Gatenby shooting the puck more and becoming increasingly involved in the offense? Love it. A solid week for the Rockets if you look at the four games they played over a span of seven days. After a 4-3 overtime loss in Spokane last Saturday, the team won 4-3 in overtime Wednesday in Kamloops, beat Edmonton 6-1 on Friday and earned a 5-2 win Saturday against the Giants. The team has found the back of the net 95 times this season, the most of any one in the WHL. Not bad considering two of the teams most dynamic players, Chartier and Dube, are still out with injuries. 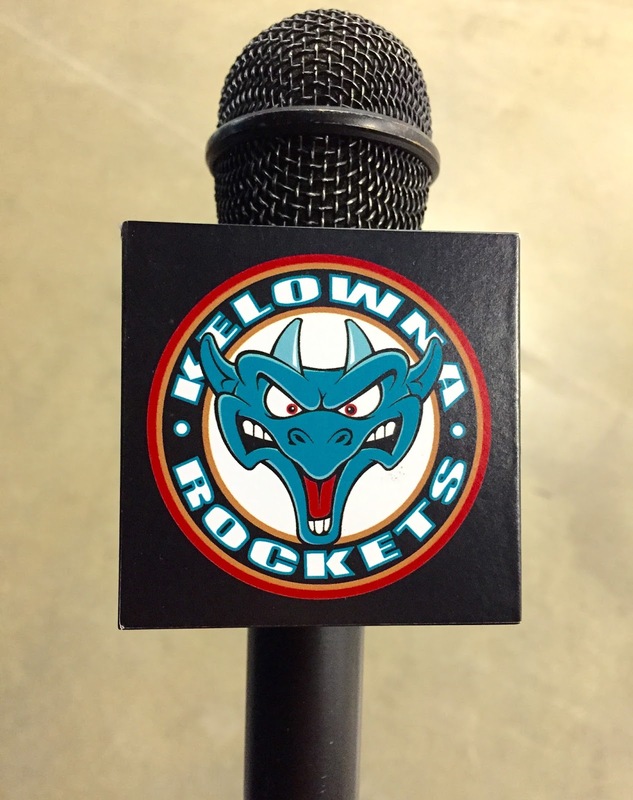 A shout out to the Kelowna Rockets Twitter feed. Check out the videos they are pumping out during games. Several of the goals scored are tweeted out quickly and even a nice hit Nick Merkley had on Giants 20 year-old Carter Popoff was quickly uploaded for all to see on social media. This is simply amazing work by Kevin Parnell. It is common place on NHL Twitter feeds, but in major junior hockey, that attention to detail is often missed. Thought I'd seen everything. Apparently not! I've witnessed a lot in my days calling games at the Western Hockey League level. I clearly remember the first brawl I was asked to describe when the Swift Current Broncos were in Lethbridge in 1995 and both benches filtered out players until mayhem was on the ice and punches were being thrown with reckless abandon. Who started it all? Broncos forward Tyler Willis. Calling my first WHL playoff game at the old Calgary Corral in 1999 with the fans packed to the rafters was an unforgettable experience. Winning two WHL championships in three seasons with the Kelowna Rockets and upsetting the heavily favoured Calgary Hitmen for the Ed Chynoweth Cup in 2009 will never be erased from my memory. Oh ya, knocking off the Portland Winterhawks in the Western Conference final last season is also up there. With all of those games under my belt behind a microphone, I thought I had seen everything. That all changed Friday night thanks to 18 year-old forward Tomas Soustal. The soft spoken forward pulled off a move I've seen before, but only on video, to the delight, shock and amazement of the fans at Prospera Place.The undrafted forward had the puck behind the Edmonton Oil Kings net. Without an option to pass, Soustal quickly and deftly, slipped the puck on his stick and in one quick motion in mid air, delivered the puck - lacrosse style - behind a startled Oil Kings goaltender Payton Lee. Not many fans realized what they had witnessed until it was quickly showed on the replay screen for the 55 hundred fans to watch from several angles. Often times over the course of the season, games in November can be dull and at times lifeless. On this night, fans were treated to something special, something that this broadcaster has never witnessed in person in my 21 seasons of calling WHL games on the radio. Tonight’s Preview: The Kelowna Rockets open a short three game home stand tonight against the visiting Edmonton Oil Kings. This is the second meeting between the two teams this season. Back on October 2nd, in Edmonton, the Rockets were a 5-3 winner. Cole Linaker, an Edmonton resident, scored twice in the win. Michael Herringer made 35 saves as the Rockets fired a season high 42 pucks at the Oil Kings net. The Oil Kings led 3-2 heading into the third period before the Rockets rallied with three unanswered goals. The Oil Kings last game at Prospera Place was February 7, 2014 in a 3-2 shootout win. Mitch Moroz scored the game winner. Myles Bell and Carter Rigby had the Kelowna goals. The Rockets have won 10 of their last 13 games overall (10-2-0-1) and are 9-3-1-0 on the road. Following tonight’s game, the Rockets host the Vancouver Giants tomorrow night and Seattle next Wednesday before traveling to the Island to play the Victoria Royals next weekend. Overall, the Rockets have points in 7 straight games (6-0-1-0). What happened Wednesday? Rodney Southam does most of his solid work with his gloves off. That wasn’t the case Wednesday in Kamloops though. The gritty forward showed good hands and determination by scoring the game winning goal in overtime in the Rockets 4-3 win. Tomas Soustal, Kole Lind and Tanner Wishnowski scored in the team’s 15th win of the season. The Rockets killed off all three of the Blazers power play chances while failing to hit the ice even once with the top power play unit in the WHL. Tyson Baillie hits record books: Tyson Baillie had two assists Wednesday in a 4-3 overtime win in Kamloops. Baillie now has 251 career points, becoming only the 5th player in Rockets franchise history to reach the 250 point plateau. Brett McLean had 375 points before being traded to Brandon in his 20 year-old season. John Varga had 333 career points with Tacoma. Jason Deleurme had 313 career points while Kiel McLeod had 261 career points. Head to Head vs. Oil Kings: The Rockets were 6-3-0-2 against the Oil Kings in the last 11 meetings between the teams. The Rockets are 3-1-0-1 in the last five seasons against the Oil Kings at Prospera Place. This and That: The Rockets have been to overtime in three straight games. The Rockets have won once in overtime and lost once in the extra period. One overtime game decided nothing and was reduced to the game ending in a shootout victory…. The Rockets and Oil Kings have many similarities. The teams are the last two to win the WHL title. The Rockets won it in 2015 while the Oil Kings captured the Ed Chynoweth Cup in 2014. The two teams have first year coaches in Brad Ralph (Rockets) and Steve Hamilton (Oil Kings). The two franchises also have a distain for the Portland Winterhawks. The Rockets have met the Winterhawks in four out of the last five playoffs while the Oil Kings beat Portland in the 2012 league championships, lost to them in 2013 in the finals and beat then again for all the marbles in 2014…Cal Foote is the next player to blow out candles. Foote turns 17 on December 13th. December birthdays are rare on the Rockets roster. The last December birthday was Cody Chikie and Filip Vasko when the two suited up for the team during the 2011-2012 campaign….The Rockets are rated as the 6th best team in the country according to the CHL Top 10 rankings this week. The Rockets were rated 5th at the start of the season….Six of Justin Kirkland’s eight goals have been scored on the road this season…. Nick Merkley was the WHL POW last week. Merkley had 4+4=8 in three wins….Jackson Whistle has started 12 of the last 15 games…Tyson Baillie has averaged 28 goals over his last three seasons…The Rockets next play three games in three nights January 29th, 30th and 31st with two of those three games on home ice….The Rockets had two players taken in the NHL draft. Nick Merkley was taken in the first round by Arizona. Devante Stephens was chosen in the 5th round by Buffalo…Cole Linaker (Oilers), Tomas Soustal (Flames) and Tyson Baillie (Flames) all received free agent tryouts. Who’s Hot: Rodney Southam has three goals in his last five games and 3+3=6 in his last five…Tanner Wishnowski has two goals in his last three games….Nick Merkley has 4+5=9 in 6 games in the month of November….Kole Lind has 2+3=5 in his last four games…Tyson Baillie has 7+17=24 in his last 13 games …Dillon Dube has 8+10=18 in his last 9 games and has collected 15 points in his last eight games….Lucas Johansen has four more point this season as he did all of last year. Effort all over the ice. Those five words would best describe the Kelowna Rockets performance Wednesday night in Kamloops. The forwards took an about face from Saturday's 4-3 overtime loss in Spokane and played with purpose in their own zone in a 4-3 overtime win against the Blazers. Rodney Southam was the hero with the game winner two minutes into three on three, but it was the play in their own zone, collectively, that was the most impressive aspect of the visitors game. Trust me, the attention to detail defensively did not take away from any creativity in the offensive zone. The team had ample chances to score and had it not been for the strong play of Blazers goaltender Connor Ingram, overtime would have been a pipe dream. Ingram, the games third star, was so good he denied breakaway chances from Nick Merkley, Kole Lind and Tanner Wishnowski before Tomas Soustal finally beat him with a snap shot to give the Rockets a 3-2 lead. With Ingram on the bench for the extra attacker, Collin Shirley would score his second goal of the game with 27 seconds left in regulation time to send the game into overtime. The game winner came from an unlikely source when Southam beat a Blazers defender to the net on the back hand before beating Ingram. It was Southam's first game winning goal of the season and allowed the Rockets to move into a tie with Prince Albert and Victoria for first place in the Western Hockey League standings. All three teams have 31 points, with the Rockets holding two games in hand on the Royals and one on the Raiders. Soustal's goal was his first in 12 games. Soustal played on a line with Tyson Baillie and Justin Kirkland. Tyson Baillie collected two assists giving the 20 year-old 251 career points, becoming just the fifth player in Rockets franchise history to reach the 250 point milestone. The Rockets have 9 road wins, tied with Victoria for the most in the WHL. The Blazers didn't take a penalty in the game which didn't allow the Rockets #2 power play unit on the ice for even a single skate. Gage Quinney faced his old team for the first time and the 20 year-old had no less than two great chances to score. Quinney's best chance came on a partial breakaway in the second period when goaltender Jackson Whistle got a piece of Quinney's shot with his blocker, deflecting the puck over the left side of the net. Quinney ended the night with an assist. If you are the Blazers, take the point and run. While the home team was badly outplayed in the first period, I thought they were better as the game went along. On a night of several turnovers that allowed for quality chances for the Rockets on Ingram, even Blazers head coach Don Hay should be satisfied with a point when his team could have come away empty handed. The win snapped the Blazers five game home ice winning streak. A nice interview with veteran forward Cole Linaker last week when he reflected on playing his 200th WHL game. The 20 year-old spoke about the team-mates he has played with over the years. "We have such tight knitted teams since I have been here. All the big name guys, we have had so many, there is something about all of them. We haven't had many egotistical guys. I think that falls to Bruce's (Hamilton) credit. At the start of every year he always talks about wanting good guys and it will make us successful", Linaker told me while watching the Zamboni clean the ice at Prospera Place. "We have had a pretty humble group of guys over the years since I've been here. We have not had anyone that has held himself above the rest considering the impressive list of skilled guys we have had here. We have had skilled guys that could have but didn't. They were just part of the team and the success we have had over the last three years, it is in large credit to those skilled players for conforming to the teams beliefs and that's winning championships". Linaker added. 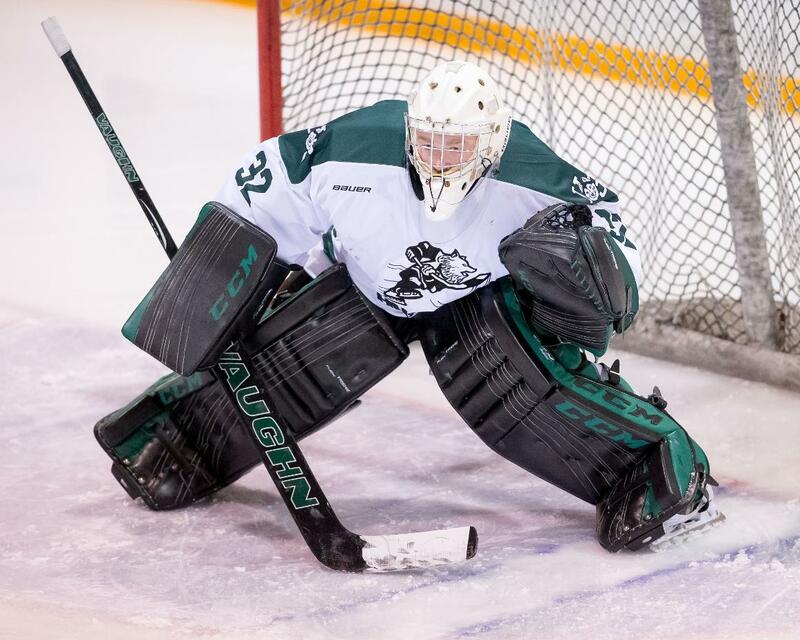 Jordan Cooke is now a starting goaltender with the University of Saskatchewan Huskies. Cooke is off to great start with 9 wins in 11 games. Last season, Cooke's first year of university hockey, he shared goaltending duties which allowed him to play in 14 games where he posted a record of 5 and 9. Gage Quinney would like nothing more than to play well against his former team-mates. The 20 year-old has the first of six chances to show the Rockets that they shouldn't have traded him when his Kamloops Blazers face the Rockets tomorrow night at Sandman Centre. Quinney is a streaky player, who can light it up when he is on his game. A good example was Sunday night when he had 3+1=4 in the Blazers 9-1 win over visiting Prince George. You know Quinney will be motivated against his former team. The Vancouver Giants find themselves in the basement of the WHL's Western Conference and head coach Lorne Molleken isn't pleased. When I spoke with the veteran coach last week, he told me it is pivotal to keep a good attitude despite getting off to a tough start. "For me, it is staying positive and remaining positive. My message to the players is stay positive and don't get down on a team-mate. We just need a way to start scoring goals. I think Scott Bonner (GM) has done a nice job of bring in guys from winning programs." You have to admire Molleken for the way he handled the Brendan Mennell situation. Mennell walked out on the team earlier this month and returned a short time later after reconsidering. Molleken could have made life miserable for the kid. He could have made him a healthy scratch for turning his back on the team. Instead. a more gentler Molleken has played the 18 year-old defenceman in every situation and is logging major minutes. Tomas Soustal was playing with a load of confidence when the puck dropped on the 2015-2016 season. The sophomore forward had 6+5=11 in his first 9 games. In his last 9 games, Soustal has just two points 0+2=2. If you are a draft eligible defenceman and you are trying to impress the NHL scouts watching, how can you not show them that you can hit? You don't need to crash into everyone around you like a bull in a china shop, but show even a touch of aggression. Let's face it, if you don't show it in major junior, how are you possibly going to compete playing that non-contact game at the pro level? 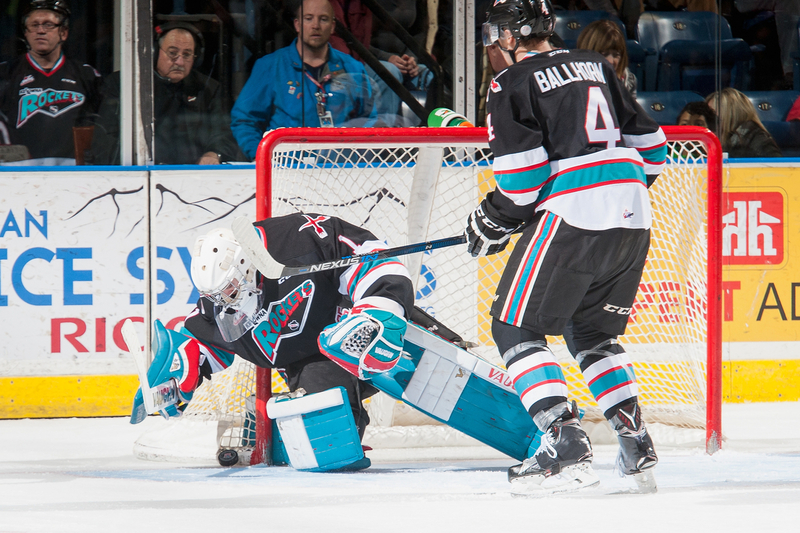 Gordie Ballhorn is making an early run for the Kelowna Rockets rookie of the year. In a horse race with Cal Foote, Ballhorn really competes hard. Sure, he makes mistakes. Who doesn't? I can overlook errors if you are competing hard all the time. In my eyes, Ballhorn's compete is among the best on the team. The Rockets have hit the 20 game mark. At this time last year, Rourke Chartier had scored 22 goals. This season, because of injury, the San Jose Sharks draft pick has just three goals in seven games. No easy night's when Jackson Whistle is in goal. So far this season, the 20 year-old has faced 442 shots in 14 games. On average, Whistle faces 32 shots per game. Playing in 50 games last season, Whistle averaged 27.8 shots per game or essentially four fewer pucks coming his way. I would also suggest the quality of the shots are much greater this season. It isn't every day that a Kelowna Rockets prospect has the bragging rights of having a highly touted NHL draft pick living in his home. That was the case when defenceman Cal Foote was growing up in Denver, Colorado. Foote's family billeted Matt Duchene when he was drafted by the Avalanche and began his NHL career in 2009. "It was really cool. He had a lot of hype being the third overall pick. When Kelowna asked me to come out and play, Matt told me to go because he playing in the Ontario Hockey League. Duchene played two seasons with the O-H-L's Brampton Battalion. Loved the quote from Prince George Head Coach Mark Holick Sunday after his team was drilled 9-1 in Kamloops. He told Gregg Drinnan, "We haven't pissed a drop in this building all season". I really liked watching the Canada-Russian Challenge featuring essentially the WHL All-Stars against the Russians. Sure, the game in Kelowna was a blowout, but the skill level was impressive. If we can't have an all-star game, this is about as close as we are going to get it at the WHL level. I will admit as the series moves further East, my interest in it has dropped significantly. Leon Draisaitl. Fantastic in an Oilers uniform. What a privilege it was to call a handful of his games at the WHL level. No excuses in a 4-3 overtime loss Saturday night in Spokane. The Kelowna Rockets were well rested. The Rockets were waiting in their hotel room in Spokane Friday night while the Chiefs were four hours down the road playing the Everett Silvertips. The Rockets should have been fresher. Sadly, the Chiefs were more determined in the one goal win. Defenceman Jason Fram scored the game winner in overtime as Spokane rallied from a 3-1 third period deficit, snapping the Rockets five game winning streak. Despite the loss, the Rockets did pick up a point and moved into a tie with Victoria for first place in the Western Conference with two games in hand. What has been a trend through the first month and a half of the regular season is the teams reliance on goaltender Jackson Whistle. The team gives up way too many golden scoring chances, with Whistle bailing them out more times than not. 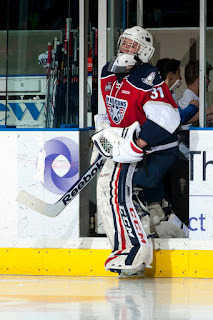 Whistle had to be on top of his game Saturday night, making two breakaway saves against 44 goal man Adam Helewka in the first period and another early in the third. Helewka would be denied on the first period scoring chance, but a weak back check allowed Dominic Zwerger to cash in with the rebound with Whistle down. Helewka was again denied by Whistle when he found himself all alone on an early third period power play. Again Whistle kept the visitors up by a goal. The easy suggestion without watching the video highlites (www.kelownarockets.com) is to suggest the young defensive core is making a boat load of mistakes, but it is far from the truth. The forwards are as guilty as any of flying the zone, not back checking hard and having little regard for play in their own zone. Often times they are not exposed because of Whistle's terrific play. The game winning goal is scored when Tyson Baillie takes a major gamble by trying to strip the puck from Chiefs forward Adam Helewka while team-mate Justin Kirkland is trying to do the same thing. It allows Spokane d-man Jason Fram and team-mate Jaret Anderson-Dolan to essentially create a two on one with only defenceman Lucas Johansen back to defend. Anderson Dolan gets the puck and promptly sends it over to Fram at the right side of the net and it is game over. Under the new three on three format, man to man coverage is pivotal. If a player cheats, it often results in a scoring chance for the other team. That is exactly what we saw in Saturday's setback. All was not negative. A nice offensive game for rookie Gordie Ballhorn. The 18 year-old scored once and added two assists in the overtime loss. Ballhorn is the most proactive shooter the Rockets have on the blue line. No one else on the d-core wants to shoot the puck it seems. Ballhorn is trigger happy and good on him for not only distributing the puck but making the opposition second guess themselves that he may unload it towards the net. Tanner Wishnowski made the biggest impact among the forwards. The 18 year-old was clearly the most physical with a real nice hit on Chiefs d-man Evan Fiala in the third period. It was the first time this season the Rockets dropped two points after leading after two periods. The team is now 10-0-1-0 when leading after 40 minutes. Emotional let down? Had to be! 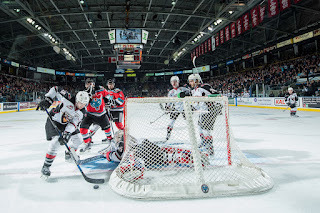 After two emotionally filled games in Portland on the weekend against what the Kelowna Rockets consider their best playoff rival, it was an uninspired effort Wednesday against the last place Vancouver Giants. Do we blame the music man for the lack of atmosphere in the building before puck drop? No music was heard pounding in the arena as fans began filing into Prospera Place after giving their respects to the many men and women who sacrificed their lives for our freedom. It was a somber effort by a Rockets team that squeaked out a 2-1 shootout win. Tanner Wishnowski tied the game with 10 minutes left in regulation time before Nick Merkley scored the game winner in the shootout. The path to the team's 14th win of the season, and fifth overall, was an ugly one to say the least. A typical decent start for the Rockets, who were experiencing their first afternoon game of the season. The problem was a lack of jump throughout the entire line up and the slow decision making of virtually the entire team. Face it, they didn't have it. The only one with a decent excuse for sluggish play was Nick Merkley, playing his fifth game in six night's. Funny how Merkley may have created the best scoring chances in the game and was named the third star. Merkley was sent alone on a breakaway in the second period and made the odd decision of passing the puck off to a trailing Justin Kirkland, who was as shocked as any that Merkley gave him the puck rather than shooting. Merkley was also robbed on a wrap around chance after taking Giants defenceman Ryeley McKinstry off the puck while shorthanded. Merkely stole the puck behind the Giants net, circled out in front only to see goaltender Daniel Wapple make a diving save with his left glove to keep the puck from going over the goal line. Wapple was solid throughout the night and probably deserved a better fate. Getting back to Wishnowski, the 18 year-old was making his first appearance after sitting out eight games after blocking a shot. Wishnowski opening the scoring when his weak shot hit Wapple's left pad, which was situated behind the goal line while attempting to defend against a pass from behind the net. After video review, it showed that Wishnowski's shot indeed went over the goal line, hitting Wapple's pad before quickly coming back out. It was Wishnowski's second goal of the season and first since finding the back of the net October 6th in Medicine Hat. Jackson Whistle wasn't given a star in the building but I thought his strong play in the first two periods specifically allowed his team to stay close. Whistle's only mistake, and it wasn't really his fault, was when Giants forward Tyler Benson skated on left wing and took a shot that seemed to glance off a defenders stick before beating Whistle to his glove hand side. The 20 year-old now has 10 wins this season, which is slightly behind league leader Coleman Vollrath of the Victoria Royals who has 12 victories. Tyson Baillie had his 8 game point streak snapped. Cole Linaker played in his 200th career game. Sixteen year-old Jonathan Smart made his debut against the Giants. Smart, who has been out with mono before finally getting healthy enough to play at the Under 17's in Dawson Creek/Fort St. John, saw limited duty but played well. To make room for Smart, the Rockets elected to put Danny Gatenby up at forward where he too saw sporadic duty. The Giants did not dress 20 year-old Trevor Cox, who remains out with a hand injury sustained in a fight against Lethbridge. Cox is expected to make his Giants debut Friday night. The Rockets have now won 17 consecutive games on home ice against the Giants. I find it interesting that Vancouver Giants owner Ron Toigo is often speaking to the media about his team and head coach Lorne Molleken isn't afraid to stick his head in front of a microphone when asked. But where is GM Scott Bonner? Is he not the quietest GM in the WHL? Bonner makes trades and isn't scared to pull the trigger to make his club better, but in a large market like Vancouver where media exposure should be welcomed, shouldn't Bonner be more available to the media? Tonight’s Preview: The Kelowna Rockets play a rare home game this month when they welcome the Vancouver Giants this afternoon to Prospera Place. This is the second meeting of the season between the two teams after the Giants were a 5-2 winner back on September 27th. In that game, the Rockets third game in three nights to start the season, the Giants built up a 5-0 lead before Tomas Soustal and Lucas Johansen scored in the team’s first loss of the season. Michael Herringer was tagged with the loss in goal. The Rockets are riding a season high four game winning streak after back-to-back wins in Portland last weekend. In Saturday’s 8-5 victory, the Rockets erased a three goal deficit by scoring the next five goals. Kole Lind, Cole Linaker, Rodney Southam and Tyson Baillie each had a goal and two assists in the win. Justin Kirkland had two goals, including the game winner in the third period. The Rockets have won eight of their last ten games overall and are 8-3-0-0 on the road. Following tonight’s game, the Rockets are in Spokane Saturday before traveling to Kamloops next Wednesday. The next home game is Friday November 20th against the visiting Edmonton Oil Kings. Four game winning streak data: The Rockets have out-scored the opposition 21-12. Of the 21 goals in those four games, only four have been scored in the first period. The big period has been the third where the team has found the back of the net 11 times. In the second period the Rockets have scored six goals. Seven of the 12 goals the team has surrendered during this four game winning streak have come in the third period. During the winning streak the Rockets have scored 7 power play goals on 17 chances (41%). Specialty teams not ordinary: The Rockets power play has struck for at least one goal in 8 consecutive games. Over that span it is 13 for 35 (37%). The penalty killing unit has killed off 34 of 39 penalties against them over that same 8 game stretch. Baillie Approaching 250! Overage forward Tyson Baillie is two points shy of 250 for his career. Only four other players have recorded that many points, all wearing a Rockets uniform. Brett McLean had 375 points before being traded to Brandon in his 20 year-old season. John Varga had 333 career points with Tacoma. Jason Deleurme had 313 career points while Kiel McLeod had 261 career points. Head to Head vs. Giants: The Rockets were 8-0-0-0 against the Giants last season. In the last five seasons the Rockets have 27 wins in 33 regular season games against their BC Division opponent. The team has lost just three times in regulation time with the other three losses coming in overtime. The Rockets have won 16 consecutive home games against the G-Men. The last loss was March 19/2011 in a 4-3 setback. Andrej Stastny scored the game winner at the midway point of the third period on Adam Brown. Zach Franko, Colton Sissons and Geordie Wudrick scored in a losing cause. ‘Linny’ let’s loose: Overage forward Cole Linaker is off to a great start to the season. The 20 year-old has 7+6=13 in 16 games. Linaker has goals in four of his last six games and goals in five of his last eight. Linaker also has points in five of his last six games. Linaker is playing in game #200 this afternoon against the G-Men. This and That: Nick Merkley is the WHL POW. Merkley had 4=4=8 in three wins last week…..Tyson Baillie and Lucas Johansen share the same birthday. The two were born on November 16th. Baillie will turn 20 while Johansen will turn 18….Jackson Whistle has started 9 of the last 12 games…Tyson Baillie has averaged 28 goals over his last three seasons…The Rockets next play three games in three nights January 29th, 30th and 31st with two of those three games on home ice….The Rockets had two players taken in the NHL draft. Nick Merkley was taken in the first round by Arizona. Devante Stephens was chosen in the 5th round by Buffalo…Cole Linaker (Oilers), Tomas Soustal (Flames) and Tyson Baillie (Flames) all received free agent tryouts…The Rockets were 3-2-0-0 in five games during the pre-season. Who’s Hot: Kole Lind has 7 points (3+4=7) in his last eight games…Tyson Baillie has 7+14=21 in his last 10 games…Baillie is riding a eight game point streak (6+13=19) over that period …Dillon Dube has 8+10=18 in his last 9 games and has collected 15 points in his last eight games…Dillon Dube has points in 11 of 15 games this season….Lucas Johansen has three more point this season as he did all of last year…Nick Merkley has 5+10=15 in his last 9 games. Who’s Not: Tomas Soustal hasn’t scored in 9 straight games. As Yogi Berra said, "Deja Vu All Over Again"
A 3-0 deficit. The Kelowna Rockets changing goaltenders after a tough start. The visiting team putting up eight goals at the Moda Center. A crowd in Portland which was over 10 thousand. Sound familiar? 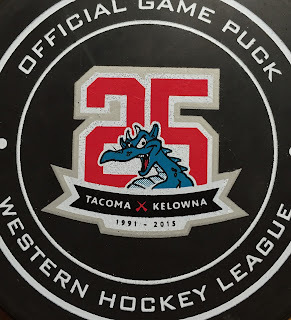 The stakes were significantly less than they were in game six of the Western Conference final in May, but the Kelowna Rockets followed a similar script Saturday night in an 8-5 win over the Winterhawks. The Rockets rallied with four goals in the second period and four more in the third in their 13th win of the season. Tyson Baillie and Kole Lind each scored once and added two assists in the character building win. I'm not sure who gets credit for pulling starting goaltender Michael Herringer after giving up three goals on 11 shots in the first period, but the move paid off. Herringer had no chance on the opening goal, but I thought he was far too deep in his net when the Winterhawks made it 3-0. My belief is a goaltender has to make a significant save even if the team in front of him is flat. It didn't happen, and I have no problem with Jackson Whistle replacing Herringer to start the second period. The Rockets lost forward Dillon Dube early in the first period when he was clipped by a stick in the eye from team-mate Joe Gatenby. The 17 year skated off the ice in panic and was quickly rushed to hospital with serious concern for Dube's vision. Without getting into detail, the end result showed no permanent damage to Dube's eye. The speedy forward stayed overnight in Portland and returned to Kelowna in the morning. Dube will not play in the Canada-Russia Challenge for the WHL against the Russian Selects, but honestly that means little in the big picture. The good news is Dube is OK and will return to the line-up in three weeks no worse for wear. With the loss of Dube, I thought Calvin Thurkauf really elevated his play. The Swiss forward has 12 points in 18 games as a rookie. Thurkauf looks hard to play against thanks to his 6'1, 202 pound frame. Once he realizes he can play a power game on the North American ice, the points will come. Rookie Kole Lind had a breakout game with a career high three points. Lind now has 12 points in 18 games. In assessing Lind's play, he creates no less than one ideal scoring chance for himself every game. Bank on it. Often times he is unable to finish, or the point totals would be even more impressive. The fourth round bantam pick can score, finding the back of the net 45 times playing midget hockey in Saskatoon two years ago. That doesn't necessarily translate into success at the WHL level though. That said, Lind is a nice complement playing on a line with Dillon Dube and leading scorer Tyson Baillie. The best goal of the game came on a nice four way passing play, on the power play, to make the score 7-4. Joe Gatenby passes the puck to Lucas Johansen at the right face-off circle. Johansen feathered a pass to Tyson Baillie at the left face-off dot who promptly hits an awaiting Justin Kirkland on the back door for a picture perfect goal. It was Kirkland's first two goal game since February 7th of last season against the Kamloops Blazers. Kirkland also snapped a five game goalless streak. Weird stat. Justin Kirkland has six-two goal games in his career. All six have come on the road. Nick Merkley is back! While riding a modest four game point streak, Merkley has 5+4=9 over that stretch. Merkley is a threat every time he has the puck and is heating up at just the right time in an effort to play for Canada at the World Junior Hockey Championships. Tyson Baillie is riding an 8 game point streak and is two points shy of 250 for his career. Baillie had a career high - 10 - game point streak last season. In the last three seasons, the Rockets are 5-0-1-0 in their last six regular season appearances in Portland. The Rockets are 8-3-0-0 with Rourke Chartier out of the line-up. Impressive considering Chartier racked up 48 goals last season and many believe when he returns from injury he will be anointed the captain. Jackson Whistle has an unorthodox way of stopping the puck. The Kelowna Rockets veteran goaltender won't win style points with the judges who prefer a more controlled approach, but the 20 year-old just stops the puck. Whistle made his best save in the dying seconds of last night's 5-4 win over the Portland Winterhawks by robbing forward Paul Bittner. In a mad scramble behind the Rockets net with time ticking down, Bittner saw the puck pop out to him at the side of the net. With one quick motion on his backhand, Bittner sent it towards what appeared to be a wide open net. Whistle, at the opposite side of goal, flung his trapper out in desperation and literally swatted the puck away. While surrendered four goals on the night, Whistle's game saver is worth another look on video if you haven't had a chance to seen it. This was a fun game. Are any games between the Rockets and Winterhawks bland? If so, rarely. The lead changed hands a couple of times and even a two goal lead late in the third period wasn't safe as the Rockets took back-to-back penalties in the final 3:30 to make for a mad finish. Rookie Calvin Thurkauf took a checking from behind penalty and the Winterhawks would score on the power play to make it 5-4. The crowd at Moda Center went crazy and the finish with the buzzer finally sounding was frantic as always. Nick Merkley had a breakout game. The 18 year-old had a four point night (1+3=4) which was his greatest one game output of the season. Merkley's goal was the result of Cole Linaker's hard work by racing for a puck inside the Winterhawks zone. Merkley's assist on Rodney Southam's goal to make it 3-3 was the result of Calvin Thurkauf's board battle win behind the Winterhawks net. Merkley picked up the puck as Thurkauf was squeezed out on the play and promptly found Southam cruising through the slot. It may have been the prettiest goal of the game. One thing the Rockets likely learned from Friday's game is the Winterhawks defenceman like...no love.....to join the attack/rush. All four goals were scored by defencemen. Lazy back checking by the forwards can't be tolerated tonight in the rematch between the two team's. The video evidence doesn't lie. Watch Portland's third goal where d-man Keoni Texeira is part of a four on two inside the Rockets zone. The opening goal was also the result of rookie blue liner Conor MacEachern joining the attack and finding himself in a grade A scoring chance between the hash marks, with no one in sight, for a 1-0 Winterhawks lead. Tyson Baillie had two goals in the win. Now with 12 in 17 games, Baillie's goals came on the power play, which went 3 for 3 in the game. Baillie is now 5 points shy of 250 for his career. It was my first look at highly touted Portland defenceman Caleb Jones. The WHL rookie came as advertised. I thought he made good outlet passes and was selective when carrying the puck up the ice. The player I liked the most on the Winterhawks was Rodrigo Abols. Head Coach Jamie Kompon loves to use him and he must have led all skaters in ice time. A little to pass happy for me, but a play maker tends to do that. Abols creates scoring chances and will undoubtedly find chemistry with fellow Latvian Rihards Bukarts. Bukarts made his debut last night with his new team and while not a huge threat, let's give him a break. It is never easy for a player, no matter what the skill set, to make an impact right away with his new team. I think Bukarts should easily score 30 goals with the Winterhawks this season. The more I watch rookie defenceman Gordie Ballhorn, the more I like what I see. Ballhorn's battle level is getting better by the game. The thing I like most is his willingness to shoot the puck. I think the Rockets d-men, as a group, have to be more proactive in firing it from the point. Team's had to respect that blast from the blue line last season when Madison Bowey and Josh Morrissey where letting cannon's go. That has to happen again. Hey Gordie, tell Cal Foote to lean into a few more too. When Foote fires one off, it comes low and hard. It was nice to hear public address announcer Dan Folick's (making a guest appearance) voice resonating through the Moda Center last night. His, 'Here Come The Hawks' is something that was common place at home games in Portland for 18 years until he elected to step away in 2009. His voice refines power and passion. I love it. I didn't have a chance to say hello to him before game time as he was situated at the other side of the arena. I will have to make a beeline towards him for a quick chat in this evenings rematch. The Rockets were 15-1-0-1 after 17 games last season. The team is currently 12-5-0-0 after 17 games. Not bad for a team that has played a good portion of the season without 48 goal man Rourke Chartier, who hopefully will play as early as next weekend. 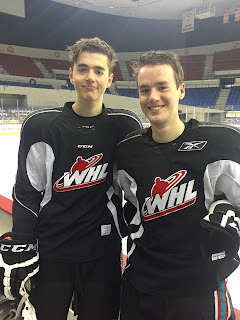 There have been many brother acts that have found themselves team-mates with the Kelowna Rockets over the years. Gavin and Kiel McLeod would be a good example. How about Lucas and Evan Bloodoff? Josh and Jake Morrissey as early as last season perhaps? This season, third year defenceman Joe Gatenby has been joined by his younger brother Danny on the Rockets blue line. The 18 year-old, Joe, says it is nice to see his younger brother making his mark in the Western Hockey League. "It is pretty special to have Danny around. We have always been best friends growing up, so it is pretty cool to have him on the team. He has worked really hard and it is great to see him get this opportunity." Danny, who was listed by the Rockets while playing midget hockey with the Okanagan Rockets, admits it is nice to have his big brother around as he gets used to life in the Canadian Hockey League. "It makes it a bit more comfortable. It is someone to go to and someone you can rely on", Danny added after a quick practice Thursday in Portland. "Joe can give me some tips and show me the ropes. Playing with him is pretty special". While both brothers are defenceman with the Kelowna Rockets, that wasn't the case when Joe started his hockey career. The elder Gatenby was a right winger and often played spring hockey in Calgary on a line with Nick Merkley. "We were pretty good together", Joe said with a chuckle. "I had to move to defence because I had Exertional Asthma and I couldn't catch my breath, so I found when I played defence I could catch my breath a little bit better. I eventually outgrew my asthma and I developed pretty well on defence so I stayed there". Joe and Danny not only live with each other in Kelowna during the hockey season, but on this recent road trip to the U.S Division, the two brothers are rooming with one another. "I have to let him know who is in charge in the hotel room. ", Joe laughed. "I think I have ultimate control of the TV remote". Danny just shrugs his shoulders. The 17 year-old blue liner doesn't care. Danny just wants to get better by watching his older brother Joe in crucial situations. "The number one thing that comes to mind when I think about Joe is his work ethic and his heart. You watch him out there on the penalty killing unit and he is fearless and is never afraid to block shots. Joe is solid defensively and an amazing skater." While Joe and Danny are enjoying playing together with the Kelowna Rockets this season, the goal for the Gatenby Brother's is to cross paths again, when they play professional hockey down the road. For now though, Joe will have to enjoy the small pleasure of keeping Danny from taking the TV remote. You want the truth? The Kelowna Rockets didn't deserve to win last night's hockey game. Funny how it works. They did! In a game that can only be described as playing good enough to win, the Rockets used a pair of goals from Nick Merkley in the third period in a 3-1 victory over the Tri City Americans. The Americans could have won, or in a worse scenario, pulled out a point if they didn't struggle scoring. That and starting goaltender Jackson Whistle was good in making 25 saves. The game deserved to go into overtime, frankly, when Americans forward Morgan Geekie had a wide open net in the third period and shot the puck wide. Let's keep this game in mind when the Rockets play well and still end up losing. If you look at the glass half full at the end of the night, even good team's find a way to win when they play poorly. Slow starts have not been a problem for the team this season. It has been common place that the Rockets come out quickly. It was the case Tuesday night where they fired 14 shots at Americans goaltender Evan Sarthou in the first period. My greatest fear was the Americans hanging around in a 0-0 game and possibly scoring the lead goal and then playing defensive hockey in an effort to squeeze out the two points. Nick Merkley hit the goal post on the Rockets first shot on net and Dillon Dube was robbed by the left pad of Sarthou on a shorthanded backhand to keep the game scoreless. Eventually, Kole Lind, who is the team's early candidate for rookie of the year, scored on a blown two-on-one with Dillon Dube late in the second period. Lind took the shot, the puck went off Sarthou's left pad and Dube shot it wide. Sitting behind the net, Lind promptly picked the puck up and skated in front of the net and fired it into the yawning gage. Penalties. Way too many of them if you wear Kelowna Rockets colours. The undisciplined, lazy penalties are often times a killer. I hate to point fingers, but veteran Tyson Baillie was the greatest offender. A player of Baillie's ilk shouldn't be taking that many penalties per game. Baillie had three minor penalties in last night's win and has 30 penalty minutes this season, which is all most half of his total from last season when he played in 68 regular season games. In three of the last six games, Baillie has taken six minutes in penalties per-game. Fortunately, the penalty killing unit has been excellent, specifically last night where it killed off 7 of 8 opportunities. Nick Merkley's one timer on the power play was as good as you are going to witness at the WHL level. Merkley passed the puck to Dillon Dube at the right face-off circle, who promptly passed it back to Merkley at the left dot where he fired it blocker side on Evan Sarthou. It stood up as the Rockets only power play goal and the game winner. Merkley's empty net goal was the 50th goal of his career. Tate Coughlin doesn't like to hit...or so I thought. The 18 year-old forward took a charging minor after pasting Americans rookie defenceman Juuso Valamaki hard into the corner boards at the midway point of the third period. While I don't condone illegal play, it was nice to see Coughlin step out of his comfort zone and play in an abnormally aggressive manner. I am sure his team-mates fed off it too. Coughlin was also assessed a fighting major, which essentially was a wrestling match, but regardless, it was a positive step for a player who needs to bring a physical presence to the ice. Best player on the Americans side? I sure like newcomer Juuso Valamaki. Logging a lot of minutes with an injury to Brandon Carlo, among others, Valamaki is poised with the puck and is a solid addition on the blue line. While Valamaki impressed, it makes me wonder about 20 year-old Brian Williams regression as a player. Williams was a force when he scored 36 goals as an 18 year-old but doesn't have the same pop in his game. A gifted shooter, Williams should have more than three goals after 13 games. The Rockets stayed the night in Tri City before having an optional skate at Toyota Centre Wednesday before making their way to Portland, Oregon for two games this weekend against the Winterhawks. Tonight’s Preview: The Kelowna Rockets open the month of November with the start of a three game U.S Division road trip with a stop in Tri City. This is the first of four meetings between the Rockets and Americans this season. The Rockets make a return visit March 13th. The Americans make two visits to Kelowna on January 9th and January 22nd. Last season, the Rockets started the year with 10 straight wins before having it snapped in Kennewick. Overall, the Rockets were 3-1-0-0 against the Americans last season, out-scoring them 17-7. The two teams also met in the opening round of last year’s playoffs with the Rockets winning in four straight games. Following tonight’s game, the Rockets play back-to-back games in Portland (Nov 6th and 7th). The Rockets have won five of their last seven games overall. The team’s next home game is November 11th against the visiting Vancouver Giants. Head to Head vs. Americans: The Rockets are 11-5-0-0 against the Americans in the last 16 meetings between the two. Winning in Tri City isn’t easy though. The Rockets are 3-5-0-0 in their last eight regular season appearances at the Toyota Center. The Rockets are 8-0-0-0 when leading after 40 minutes while the Americans haven’t won a game in seven attempts when trailing after two periods. ‘Linny’ let’s loose: Overage forward Cole Linaker is off to a great start to the season. The 20 year-old has 6+4=10 in 13 games. Last season Linaker had just two goals in his first 13 games. Linaker has goals in three straight games and goals in four of his last five. Linaker also has points in four of his last five games. Not bad for a forward who prides himself on being a strong defensive minded player. Getting Better with Age: Tyson Baillie has nine multiple point games this season. Baillie had 20 multiple point games last season. Baillie has more points (10+17=27) after 15 games than he had after 15 games (11+8=19) last season. This and That: Tyson Baillie and Lucas Johansen share the same birthday. The two were born on November 16th. Baillie will turn 20 while Johansen will turn 18….The Rockets have attracted the 5th most fans in the WHL as they close out the month of October. The team has attracted an average of 5,107 fans per game after seven home games …Jackson Whistle has started seven of the last ten games…Tyson Baillie has averaged 28 goals over his last three seasons….Rockets rookie defenceman Jonathan Smart is playing for Canada at Under 17 Challenge in Dawson Creek, Fort St. John this weekend….The Rockets reduced their roster October 14th by sending 20 year-old Gage Quinney to the Kamloops Blazers for a third round bantam pick...Riley Stadel has five fighting majors this season. Stadel had eight fighting majors last season….The Rockets next play three games in three nights January 29th, 30th and 31st with two of those three games on home ice….The Rockets had two players taken in the NHL draft. Nick Merkley was taken in the first round by Arizona. Devante Stephens was chosen in the 5th round by Buffalo…Cole Linaker (Oilers), Tomas Soustal (Flames) and Tyson Baillie (Flames) all received free agent tryouts…The Rockets were 3-2-0-0 in five games during the pre-season. Dare to Compare: The Rockets were 13-1-0-1 after 15 games last season. The Rockets are 10-5-0-0 after 15 games this season. The team has scored 59 goals so far this season. Last season after 15 games, the team found the back of the net 75 times. Who’s Hot: Tyson Baillie has 4+11=15 in his last seven games…Baillie is riding a five game point streak (3+10=13) over that period …Dillon Dube has 8+7=15 in his last six games and has collected 12 points in his last five games…Dillon Dube has points in nine of 12 games this season….Lucas Johansen has as many points this season as he did all of last year…Nick Merkley has 1+6=7 in his last six games. Who’s Not: Tomas Soustal hasn’t scored in seven straight games. The second year forward had five goals in his first six games of the regular season….Justin Kirkland has one point (a goal) in his last eight games…Calvin Thurkauf has one goal in his last eight games. The Kelowna Rockets avoided a two game losing streak Saturday night while handing the Lethbridge Hurricanes their first two game slide of the season. Goals from Dillon Dube and Tyson Baillie in the third period broke a 3-3 tie, leading the Rockets to a 5-3 home ice win. Following the script of playing a game on Halloween, this game was scary for the Rockets, who built up a 3-0 lead only to see the Hurricanes score three unanswered goals to tie the game. With the Hurricanes pressing, Dube beat Lethbridge goaltender Jayden Sittler with a wrist shot that saw the puck go through the net. Play continued until a stoppage where video evidence showed that Dube's shot, did in fact, beat Sittler and went through the netting. Both officials on the ice had a chance to review Dube's goal after play was stopped after Kole Lind had scored on the same sequence. As the rule stands, the disputed goal counts (Dube's) while Lind's does not. The time when Dube scored will also be added to the clock. I will admit to being confused myself in the broadcast booth as this has never happened in a game I've called. Live and learn. Overall, a much improved effort from the Rockets than a night earlier in a 2-1 home ice loss to the Prince George Cougars. Key players stepped up which makes a dramatic difference with several veteran players out with injuries. Nick Merkley, named the first star, had a goal and an assist. Tyson Baillie had a goal and two helpers and Dillon Dube had a goal and two assist. Without Rourke Chartier, Riley Stadel, Tanner Wishnowski and Tomas Soustal out with injuries, the best players indeed had to show up to play. Mission accomplished. Michael Herringer had another solid start in goal. While he allowed three, one came off a breakaway from 20 year-old Hurricanes forward Cory Millette and then the veteran forward fired a puck from behind the net that hit Herringer in the back of the leg and found its way in. I can see why teams don't like to play games on Halloween. Only four were scheduled across the league with two of them in the afternoon. Last night's paid attendance was just under 44 hundred, but the crowd was much smaller than that. In fact, it looked like a game from 2000-2001 when I first arrived in Kelowna. Several large sections of empty blue seats were visible from up on the broadcast booth. The Rockets traditionally don't like to play Sunday games, but that may have been a better option with Halloween falling on a Saturday and trick-or-treaters more interested in candy than spending time watching hockey. It was the Rockets 10th win of the season. They are the first team in the Western Conference to reach that mark. The win also moved the Rockets into sole possession of first place, a single point up on Victoria with both team's having played 15 games. Up next is essentially an entire week on the road on a U.S Division road trip. The team leaves for Tri City on Monday and play the Americans Tuesday night. From there it is a three and a half hour drive to Portland for back-to-back games Friday and Saturday night. The month of November will be a busy one. The team plays 11 games in 25 days. Of those 11 games, seven are on the road.